David met Kezia and Mike Fitzgerald in Miami at the beginning of 2017 at the PEDS 2040 conference. They had spoken previously as David had seen an innovation event that Kezia spoken at, detailing how and why CareAline had come about. Kezia developed the CareAline® Sleeve and CareAline® Wrap out of necessity when her daughter was undergoing chemotherapy for Neuroblastoma. Fearful that her infant daughter would cause an infection in, or pull out her PICC and Broviac Lines, and frustrated with the irritation that the tape was causing on Saoirse’s skin, Kezia created the sleeve and then wrap to hold Saoirse’s lines in place while still allowing access to them for infusions. Very quickly, Kezia realised that Saoirse was not the only patient with the issues. All PICC and Central Lines needed the kind of protection that the sleeves and wraps provided. CareAline® Products, LLC was founded as a way to bring these desperately needed products to ALL patients – both paediatric and adult – with PICC and Central Lines. The sleeves are designed to provide effective line management and security with an easy to use sleeve and chest wrap. Preventing Central and PICC lines from getting into nappies, dragging on the floor, being chewed on, and catching and pulling out accidentally. This is integral in keeping the patient safe while they have an implanted line. CareAline has been proven to curb, and even prevent, dislodgement in these patients, and they are actively collecting data on reduction of infection rates. 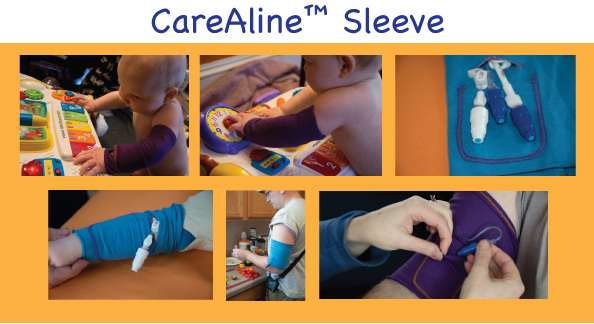 Thinking of Oscar has agreed to fund a trial supply of the sleeves into a number of hospitals in England; initially at Oxford’s John Radcliffe Children’s Hospital.